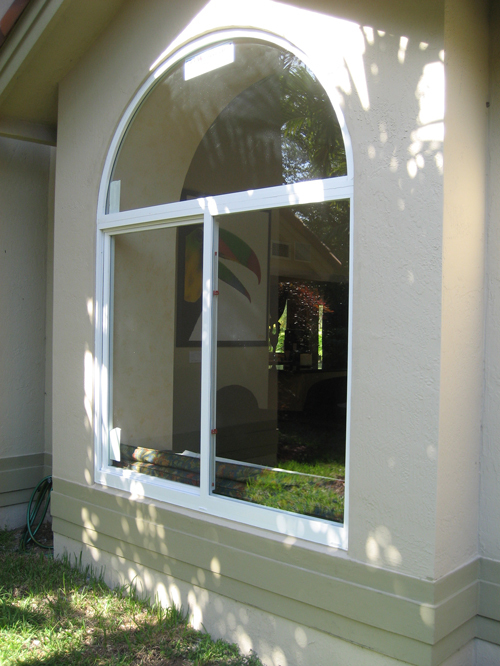 The impact windows that we install in Miami must have the Miami-Dade County Notice of Acceptance, or NOA. To check impact windows ratings, you could review the NOA of the specific window or door. NOAs will have a table showing the corresponding maximum design pressures for an impact window depending on the size and glazing makeup option used. So, properly evaluating whether or not an impact window meets all the requirements is not so simple. Important factors must be evaluated. For full service assistance on successfully moving through the entire process of replacing existing windows for impact windows, contact Astor Windows. This post is intended for design professionals who plan to specify impact-resistant sliding glass doors with three moving panels on three independent tracks. A three-track system allows for wide openings with unobstructed views when all panels stack on one end behind each other. It is important, though, to understand that the new generation of approved por impact, heavy-duty, three-track configurations could measure more than 8 inches in depth. As a result, door tracks can extend beyond tie beams' and columns' depths, which presents a problem: Miami-Dade County and State of Florida approvals require that structural substrates must provide full support to the door tracks. 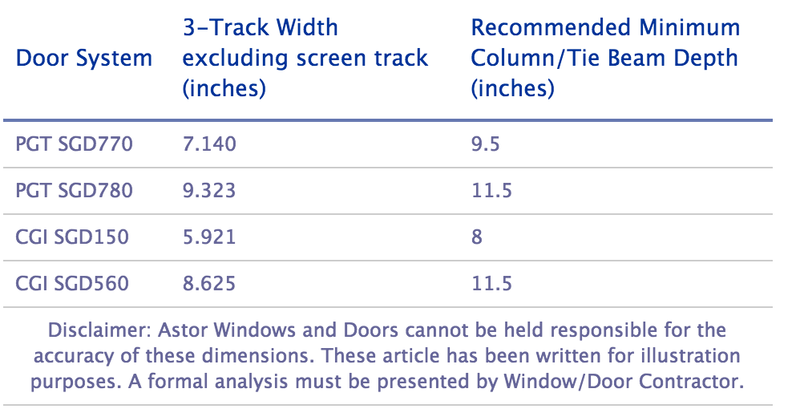 The table below provides dimensions for four impact-resistant sliding glass door systems rated for hurricane protection and approved by Miami-Dade County. 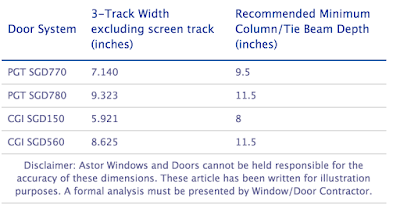 On one column we show the nominal track width, assuming no screen rail tracks are desired. On the other column, we present our estimated jamb support and tie beam minimum depth to appropriately offer full support to the sliding glass door system. It is important that architects and structural engineers learn about these track dimensions before they finalize their designs for new structures. If you are in the market looking for to purchase new impact-resistant sliding glass door systems and need a professionals with proven track records to help you design and properly install these doors, you can learn more about us at Astor Windows. Some of our homeowner clients interesting in installing impact windows at their homes are surprised to find out how well storefront system profiles look in residential applications. In the past, storefront systems were used primarily in commercial projects. 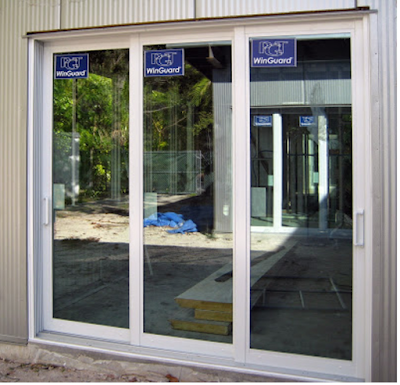 Today, given the ever demanding desire for larger and larger impact window formats, especially in our local Miami market, the storefront systems provide ample square footage of single unit glass panels Miami-Dade County approved for hurricane protection when compared to thinner profiles historically utilized in residential projects. The commercial, impact-resistant fixed panels, despite designed with bulkier profiles, do not look bad at all installed in houses. In fact, the more prominent section looks more proportionate when displayed on the large format window openings. Below, I am including a picture featuring a glass wall of impact-resistant storefront systems that Astor Windows and Doors fabricated and installed in a house in Pinecrest, Florida. As it can be seen on the above picture, the bronze frame, clear glass storefront system looks great in this hallway, allowing plenty of natural light into the house. The custom grid configuration was a homeowner's choice since we had flexibility to design the panel layout. It should be noticed that the prominent aluminum profile gives a balanced, proportionate look to the total assembly. On this particular project, the storefront systems were designed by PGT Industries and are Miami-Dade County approved for impact resistance. The storefront wall was fabricated by Astor Windows and Doors, and glazed on the site. This means that we first fabricated the aluminum grid and then installed the glass on the site (performed the glazing). If you are looking for to buy impact windows and like this system for your home, please contact us at sales@astorwindows.com or visit us online at Astor Windows. Replacing existing swing doors for hurricane-rated, impact-resistant doors manufactured in Florida for the Florida weather conditions has its peculiarities. For example, when installing a new impact door, the new door has to come with a threshold (the aluminium assembly part that goes on the bottom of the door frame) that is at least 1.5 inches in height. For new construction projects, this might not be an issue since conditions can be worked out in advance to accommodate for the new threshold dimensions. However, when working on existing properties on what we refer to as retrofit projects, then homeowners might find surprising how tall the new threshold is in comparison to the one being replaced for. For those potential client out there, we have created a short video with a 3D illustration featuring a scale-sized threshold for a PGT Industries's swing door, the Series FD101 French door. If you are replacing the existing windows of your property for impact windows, you should know that the new windows must comply with the existing Florida Building Code egress rules. The Code stipulates that bedrooms must have at least two ways of egress in case of emergency. A door to a different room or to the outside counts as one way of egress. To comply, a bedroom has to have a second way of egress through a window or through another door, such as a patio door. 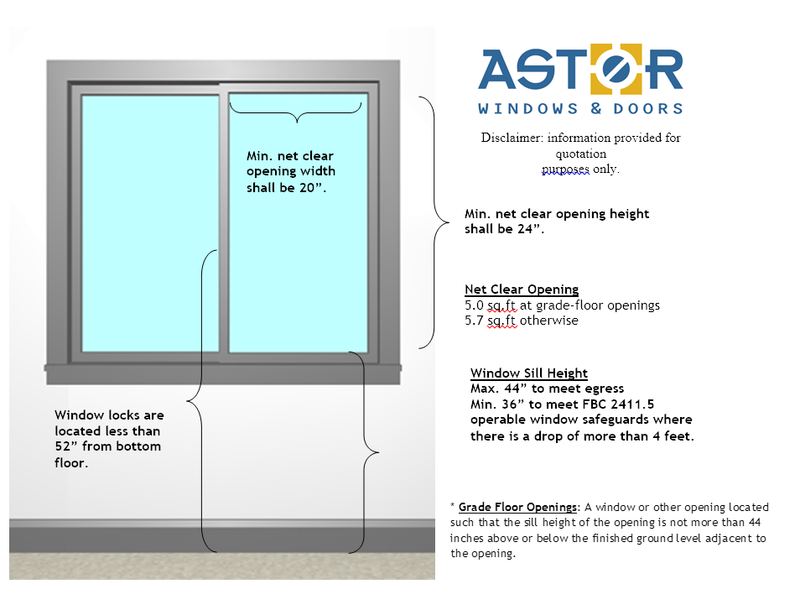 If your bedroom does not have a patio door, then at least one window must have egress dimensions determined by the Code. The window must feature a clear opening that must meet all of the following criteria. Based on Section 1013.8 of the Florida Building Code 5th Edition (2014), design professionals must take into consideration a minimum window sill height if the opening is located more than 72 inches above the finish grade. Where this condition exists, the operable part of a window must not be at less than 36 inches above the finished floor surface of the room in which the window is located. If the operable window sill is less than 36 inches above the finish surface, then design professionals must specify other means of fall protection, such as installing guard rails that do not allow a 4-inch diameter sphere to pass through. 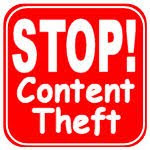 We created an video illustration below to further explain this particular condition. Visit Astor Impact Windows for information about purchasing impact windows and doors. You can also email us at sales@astorwindows.com or call us at 305-328-9138. If you have any questions or want to share additional information regarding this topic, drop us a comment below.